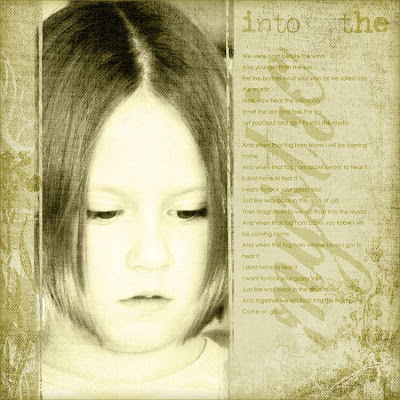 First a couple of layouts, the first one is my baby, Bronte and I used a song by Van Morrison in this one, which I love, called, Into The Mystic. Love the dreamy look on her face in this pic. 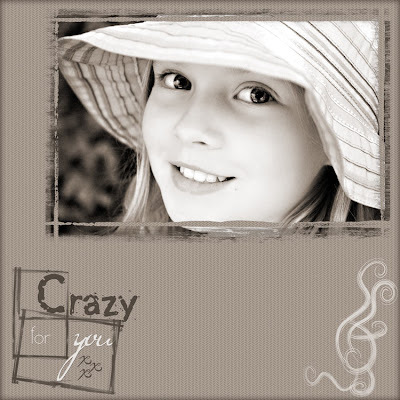 Credits: Textured Overlay from Scrap Artist. I also grunged it up a bit more with standard PS brushes. Next one is my bigger baby Quinn, this is the pic I posted last time, which I just love. The frame is by C Borgfield, but I am not sure where it is from, sorry, also the brushes are just free downloads from somewhere, but I can’t remember where. I wish people would name their brushes so I can give due credit. The background and word art are by me. Hope you all had a great Australia Day and long weekend. We came back a day early as the weather wasn’t great and was going to get worse. But it was nice while it lasted! Got to finish my audible book and got lots of relaxing in, and a lovely walk along the beach and we also got to sit on the beach, all snuggled up with the girls and watch the comet which was pretty spesh, so we did fit a lot in for the short time we were there! Also met these lovely people that were camping behind our friends, I was in the van and heard Brian chatting to them, and came out and had a short chat, I thought they mentioned something about lambs and that they were from Thorpdale, so I assumed they were Sheep Farmers, then they went off to cook dinner and we ate ours. During dinner Brian mentioned that they were actually potato farmers, I said that Shez’s parents were from Thorpdale and they probably knew Shez’s family, later on we started chatting again. “That’s me”, I say sheepishly! LOL. What a small, small world we live in! They are just the loveliest people, not that I am surprised, their daughter is very special and a great, true and loyal friend to boot! Shez, Tenille (a friend from Brian’s work), and I all went off to the Coal Country Camera Club meeting on Tuesday night. It was a great night and I look forward to more meetings. They have field trips and weekends away and best of all, families are welcome on the trips! The level of skill there is amazing and more than a little intimidating, but I just know I will learn heaps and best of all the people were lovely! Well, at least I was interested LOL. First this blog had me in hysterics http://www.thingsmyboyfriendsays.com/ it could be my sense of humour but I hope you get a giggle too, I should mention that there is some ‘colourful’ language going on here, so beware. LOL! What a small world!! Fancy camping right there with Shez’s mum!!! Love the layouts as always!! Glad that you had a good time. We were in inverloch and the weather was pretty bad, but it’s just nice to get away… really wish we had of made it too seaspray though lol. LOVE the layouts, especially that one of Bronte… LOVE the blending. The camera club sounds great Lee, and I’m still thinking about it roflol… will check out the link tomorrow…. too late now, and need to go night night ;). I love the look on Bronte’s face in that layout, and the way you’ve scrapped it is fab! The photo and layout of Quinn is just beautiful! Oooh, camera club, that sounds so much fun! But like you need any help, your photos are already brilliant! Love the links, especially the boyfriend one…very funny! Hello from England I tried to email you at Australis but I have gotten a failure email back so I am not sure if you have any of my emails. My address is crispie182@hotmail.com (old email address from Year 10) I hope the girls first day back was fun. LOL @ meeting her parents!! How neat is that, though?? Wow lots to catch up on Lee. Gorgeous photos and LO’s and so glad you have your camera back. I myself can’t wait till the day I get a DSLR but it wont be anytime soon. ROFL about meeting your friends parents…..how incredible. Great news with the camera club and as if you need any help….lol your stuff is so amazing Lee. Take care ciao for now. thanks for the kind words about my parents, yes they are nice but I’m biased ! this dreams layout is outstanding, the quote is so touching. love the pics from the swimming pool, gorgeous as ever. that perfume poster is awesome, I await your version ! lee those layouts are gorgeous! And everytime i see one of your photos i get jealous and want to grab my camera manual and learn something new, lol!! Im looking forward to see what you come up with from that poster! that is a really interesting effect! !